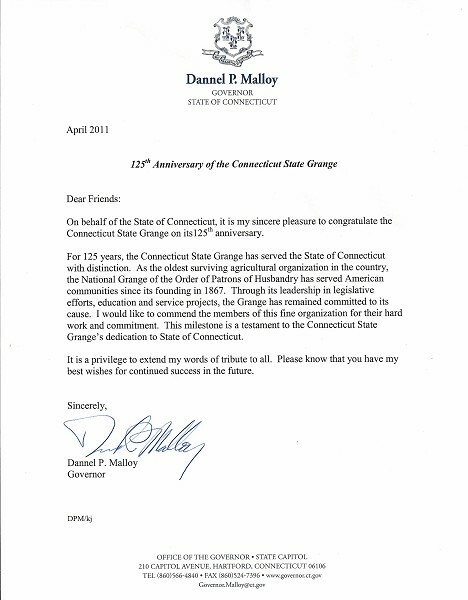 The 125th Anniversary of the Connecticut State Grange has been formally recognized by Connecticut Governor Dannel P. Malloy, stating via letter received on April 16, "through its leadership in legislative efforts, education and service projects, the Grange has remained committed to its cause." Organized in June 1885, the Connecticut State Grange is celebrating its 125th anniversary throughout 2010 - 2011. Originally formed to help farmers recover from the ravages of the Civil War, the Grange is constantly evolving and making new contributions to the State of Connecticut through the efforts of its members in the nearly 60 rural and non-rural communities it serves. Local Granges are committed to bettering their communities through agricultural initiatives, advocating legislation, service projects and sponsoring family oriented activities. "We are honored to receive this acknowledgement from Governor Malloy," said Connecticut State Grange President Jody Cameron as he extended his gratitude to the Governor. "The Connecticut State Grange and the State of Connecticut have always worked closely together and we look forward to this relationship as it continues to grow over the years." Governor Malloy, a Stamford native and former Stamford Mayor, was sworn in as the 88th Governor of Connecticut on January 5, 2011. Known for his bi-partisan manner, Malloy is committed to strengthening the state's economy, growing Connecticut businesses, and bringing jobs back to cities and towns. Alma Graham, Legislative Director for the Connecticut State Grange, received the letter in the mail. "We appreciate Governor Malloy's recognition of the strong ties that the Grange has to agriculture as well as the commitment to education and service in our state and local communities," said Graham. "It is this strong foundation which has enabled the Grange to survive for 125 years." This Gubernatorial honor comes at a time when the Connecticut State Grange and the Granges across the state are experiencing a heightened level of enthusiasm. "It is exciting to see Grange members become more involved in activities, community service and membership development," Cameron said. "This enthusiasm is evident in the number of new members Granges are taking in throughout the State." 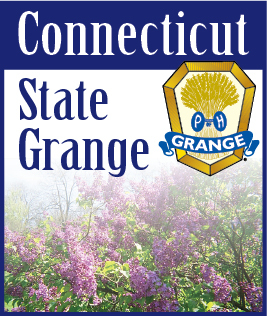 Additional information on the Connecticut State Grange and the Granges across the state is available on its website - www.CTStateGrange.org. On behalf of the State of Connecticut, it is my sincere pleasure to congratulate the Connecticut State Grange on its 125th anniversary. For 125 years, the Connecticut State Grange has served the State of Connecticut with distinction. As the oldest surviving agricultural organization in the country, the National Grange of the Order of Patrons of Husbandry has served American communities since its founding in 1867. Through its leadership in legislative efforts, education and service projects, the Grange has remained committed to its cause. I would like to commend the members of this fine organization for their hard work and commitment. This milestone is a testament to the Connecticut State Grange's dedication to State of Connecticut. It is a privilege to extend my words of tribute to all. Please know that you have my best wishes for continued success in the future.